The University of Kentucky Wildcats, the unanimous number one ranked team in NCAA Division I Men’s College Basketball, struggled mightily for the second game in a row. Kentucky was again taken to overtime (twice) by a supposed far out matched foe in the Texas A&M University Aggies. Moreover, according to the season rankings and the recruiting class rankings the Wildcats would be considered a much more talented roster than that of the Aggies. If you lived in a bubble, and didn’t have the small ranking numbers next to the school name as hint, you might not be able to discern who the better team was Saturday. The Aggies (9-4) hosted the Wildcats (14-0) at Reed Arena in College Station, and home-court was certainly on their side. From the opening tip, the Aggies played with a level of intensity that Kentucky seemed to have left in Lexington (or maybe even in Louisville on December 27th). The Cats last game, on Tuesday in Lexington versus Ole Miss, was as equally lackluster and they barely escaped over the Rebels at home in overtime with a contested 89 to 86 win. 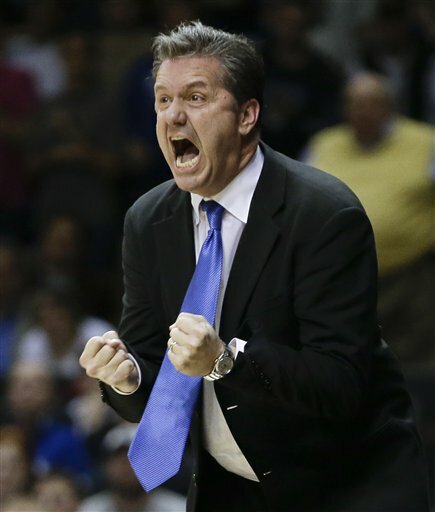 The Cats have lacked a killer instinct over the Calipari Era. They often let teams back into games, or let an opponent considered to be less-talented control the pace of games by playing without a sense of urgency, at least until the very end of a contest, sometimes with less than desired results for the Big Blue Nation. Saturday was a textbook example of this uninspiring style of play. The national writers, pundits, and so-called experts have cried afoul of the Southeastern Conference, SEC, as down competitively and in talent, other than UK, all year. However, the criticism and lack of respect seems to have only fanned the flames of the other thirteen conference schools. They are gunning for respect and coming for the Cats. Kentucky Wildcat Head Coach John Calipari. Kentucky Coach John Calipari often states, “That Kentucky plays some team’s super bowl every time they go on the court.” (See games against Buffalo and Columbia as well as Ole Miss as examples). The Wildcats have been taking the best shot of every team they face, but SEC foes, especially, don’t plan on being the autobahn to an undefeated regular season. The Wildcats fell behind early in the game and clawed back to trail by three, 28-25, at halftime. Coming back from the locker room for second half action, Kentucky picked up their intensity just enough to take their first lead of the game, 29-28, at 19:03 to play. The Aggies scrappy play continued and the teams swapped the lead back and forth through the first ten minutes of the half until Kentucky separated itself enough to take a six-point lead. The momentum shifted to Texas A&M and head coach, Billy Kennedy, when Kentucky’s junior leader Willie Cauley-Stein fouled out of the game with 4:29 to play. The Aggies never waivered, continuing to plow through and take the lead briefly before ending regulation tied 53-53 and on to overtime. In overtime the defensive struggle forged on and the teams scored a combined eight points and remained knotted at 57-57 heading into the second five minutes of extra playtime. In this game of punch trading, each was giving their best shot to the other but also taking them with gritted teeth. Freshman Reserve Point Guard Tyler Ulis. Wildcats. Freshman reserve point guard Tyler Ulis buried a three-pointer with 1:23 on the game clock in the second overtime. The youthful leadership trend of Kentucky continued with big made free throws from Sophomore Center Dakari Johnson and Freshman Forward Trey Lyles to calm the heart palpitations of Big Blue Nation, BBN, and keep the number one team in all the land undefeated at 15-0 (2-0). The secret to competing with the Cats seems to be in playing a very physical style that does not back down to their big men. Of course all of their men are big, they are the tallest team in all of college basketball, even with the 5-foot 9-inch Ullis skewing the curve. Take it to them. Play your best game of the year all while watching Kentucky implode with terrible execution. Do so and you may have the recipe for success against the Cats. So far that hasn’t been cooked up just yet. We will see just how good or not so good Kentucky is on Tuesday, as league play continues with the Missouri Tigers arrive in Lexington for prime time in Rupp Arena. Heart surgeons in the Commonwealth are lobbying against a three overtime game for BBN.